Amenities: Entry courtyard, BBQ & seating area. The top three reasons to live at Park One are; its built on the highest piece of real estate near the downtown area. Literally, the top of the hill in Bankers Hill, owners at Park One condos will soon know the true meaning of “Live At The Top”. Along with this top of the hill location, are some of the best views in the San Diego area. From the early floors on up, you can see the Balboa Park, bay, Coronado bridge, most panoramic view of the downtown skyline, Point Loma light house, the list goes on and on. Second reason to live at Park One is the privacy of having the entire floor to yourself. Park One condos are only one private residence per floor. Third top reason to buy a Park One condo is the quality of the finishes and the large floor plans. Even before you step into your condo from the private elevator foyer you notice the solid wood door is wider than any other in all of downtown. The quality and grandeur start at the front door and extend all the way to the glass railing of the two balconies. After all when you have the ability to see the landmarks that surround the building you want a glass balcony wall to preserve the view. The living rooms have a twenty-five linear feet of floor to ceiling window wall. The dining rooms will accommodate up to twelve people. French doors lead out to the balcony. Separate laundry rooms with side by side machines. The master bedrooms have views into Balboa Park. Park One is located at the NW corner of Balboa Park, in the Bankers Hill area of San Diego. It’s a special world class address with quality and views for the discriminating luxury condo buyer. There are only 14 units at Park One. Resident reviews expected to be available in 2018. Completed in 2009 Park One stands 300ft above sea level at the highest point in the City of San Diego. At a height of 150ft the building commands a stunning view of San Diego Bay, Coronado island, Point Loma, and the Pacific Ocean beyond. To the south and east there are expansive views of Balboa Park, the Cuyamaca mountains and downtown. A living area with floor-to-ceiling windows and a south-facing balcony offer year-round outdoor-indoor living. With only 14 units in the building, each unit occupies a whole floor with entry through a private, access-controlled lobby. This level of privacy is not found in other condos in San Diego. At just under 2300 SF, the condo units are at the larger end of what is typically available in the area. Park One’s location across the street from the famous Balboa Park, and at the edge of Bankers Hill and Hillcrest, makes it part of the diverse Uptown section of San Diego which consists of the neighborhoods of Mission Hills, Hillcrest, Bankers Hill, Park West, and University Heights. The eminent walkability of the area would likely rate as the most attractive feature of the location. Car-free living is a real possibility for many residents. The center of Balboa Park, with its beautiful gardens, 17 museums, restaurants, organ pavilion, Old Globe Theater (a 3-theater complex) and the Spanish Art Village, is a mere 20-minute walk from Park One. Balboa Park is host to special activities throughout the year with something for everyone. The free summertime open-air live music concerts attract hundreds of people. Downtown Gaslamp District is less than 2 miles away. 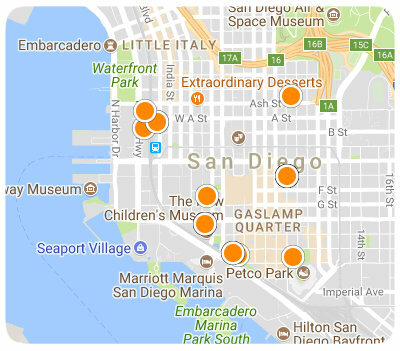 The Embarcadero District, the San Diego Maritime Museum (including the USS Midway and the Star of India), the Museum of Contemporary Art, and Seaport Village are approximately 3 miles from Park One. The San Diego International Airport is 3 miles which makes for a drive of 15 minutes at most times of day. The world-famous SeaWorld park is 7 miles. Cabrillo National Monument on Point Loma is 13 miles away and a beautiful day outing. Another world-famous attraction is the San Diego Zoo right in the heart of Balboa Park. The San Diego Zoo Safari Park (renowned for its species conservation efforts) is about 30 miles away in North County. Scripps Health System, the UCSD Medical Center and the Sharp Health System are close by. In addition, there are numerous medical and dental private practices in the neighborhood. With Balboa Park being across the street there is never a shortage of recreational activities to choose from. The numerous trails and sidewalks in the park allow for running and walking from light to strenuous. Several fitness and sports meet-up groups are available in the park. Within less than a mile are several membership-based yoga, fitness and gym facilities, including 24-Hour Fitness, Orange Theory Fitness, Pure Barre, Studio Barre, Club Pilates, and many more. Bars with live music (most nights): Martinis Above Fourth, Caliph, Imperial House lounge, Pardon My French. All venues have small dance floors that are often packed. Theater: Old Globe Theater in Balboa Park which puts on various shows including Broadway, Shakespeare, and others. Open-air Music: The Spreckels Organ Pavilion in the Park offers a free weekly organ concert. In addition, there are rotating performances by local bands 2-3 times a week all through the summer. Panama 66, a bar in the Park, has live jazz a couple of times a week. Fireworks: Fireworks can be seen all year from the Park One balconies. At least a dozen fireworks dot the horizon on the fourth of July.